At the southernmost tip of Mexico’s Baja Peninsula, overlooking the famous El Arco, ME by Meliá continues to rewrite the rules through bold design at ME Cabo. Enjoy both your private and social sides at this unconventional resort where balance is achieved through the principles of Yin and Yang. Balance your own Yin and Yang through wellness programs, spa recovery treatments, beach yoga and more, while indulging in sophisticated daytime and nightlife experiences. A fashion and social hub for a discerning local and international clientele, ME Cabo pulses with a distinctive vibe that hints of Ibiza and a bit of New York. On the beach next to town in Cabo San Lucas, 30 minutes from the airport. Mediterranean Style Beach Club; Rose Bar Lounge; Blue Marlin Ibiza Dining; Dare Bar; The Deck; The Wet Bar (Swim-up); Main Bar and In-Room Dining. 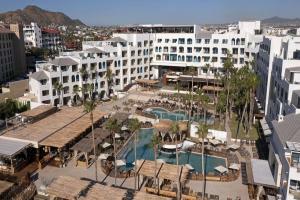 Cabo San Lucas, Lover's Beach, Scuba Diving, Horseback Riding, Golf, Sport Fishing.